The other headache is email. For me, writing email in Markdown is the holy grail and I’ve been searching in vain for a Markdown client for ages. However, today I think I’ve finally found it. I’ve been a fairly regular Postbox user now, since I got fed up with Sparrow (and this was before Sparrow announced that they were being bought by Google) but even that had annoyed me slightly. However, I’ve managed to clear up the issues I had with it pretty much. My main problem with Postbox was that I’d delete emails etc and that would not immediately be apparent on the server - some editing in the settings has changed this. 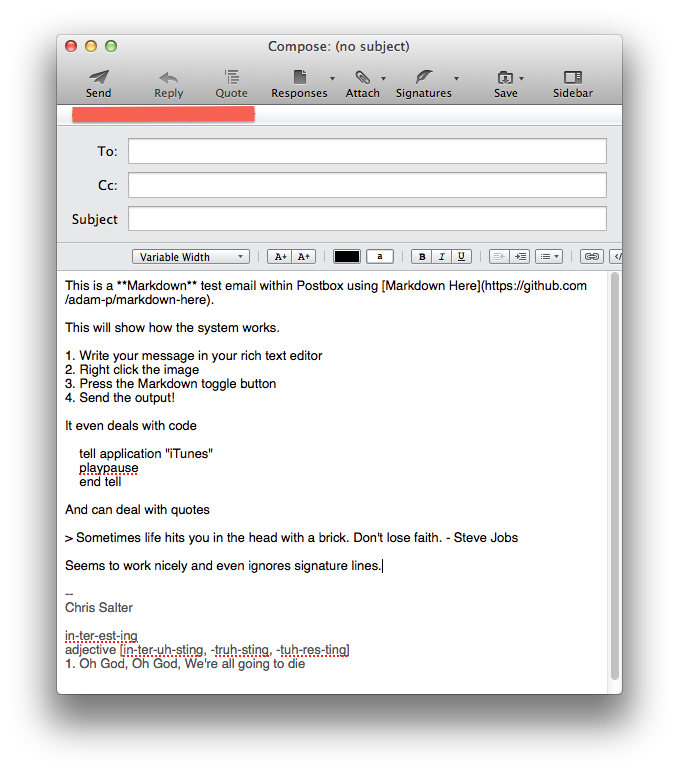 Postbox is based on the extensible Thunderbird client for Mac, Linux and Windows. The difference being, it’s been improved, especially in respect to OSX integration. The benefit of this is that some of the Thunderbird extensions work nicely on Postbox and this is how the magic happens. Step in, Markdown Here. This plugin for Chrome, Firefox, Thunderbird and importantly, Postbox, allows you to write Markdown emails and then change the input to fully formatted, rich text, HTML output. Pretty good output as far as I’m concerned! Using it on Firefox and Chrome allows you to write in Gmail and then convert your writing to rich text as well so you no longer have to stick using Gmail’s default look. Using on Firefox and Chrome also allows you to change the CSS style of the output (so you can send emails in Github style if you so wish). Unfortunately this is missing in Postbox but to be fair, it works nicely at the minute and I’ve no problems (so far!) with the output. This means I can write my emails in a fixed width font (or a font of my choosing, such as Gill Dyslexic or Mono Dyslexic) and then convert the output to a normal font that everyone else will expect the email to arrive in (it also means it wont replace my font with rubbish - a problem I had using Mono Dyslexic with Sparrow). Overall, it’s a shame I’ve recently switched to Safari for home use as this is a pretty nifty plugin. I’ll certainly be installing it on my Chrome and Firefox installs though. 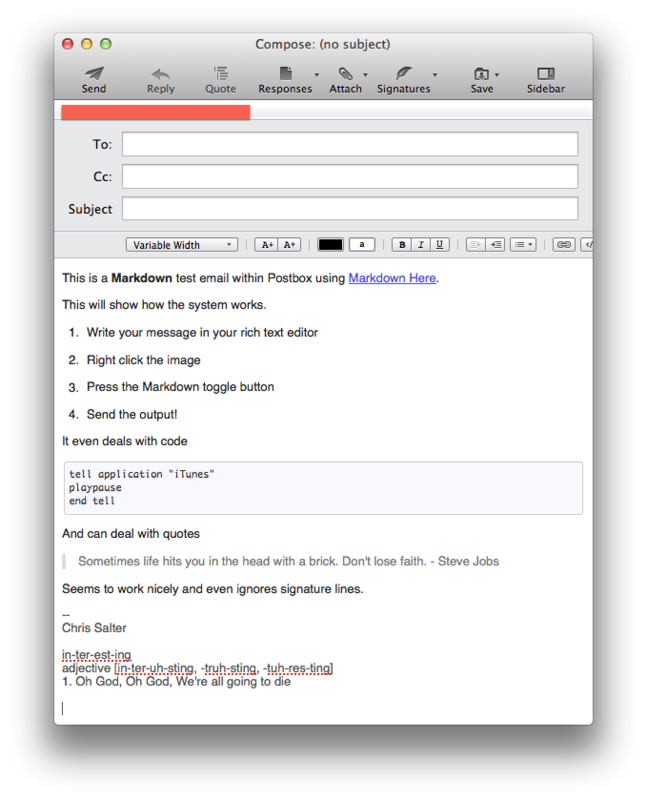 In the meantime, it’s brought decent Markdown editing to my email workflow.